It’s finally starting to warm up around here, but it’s not quite time to jump in the outdoor pools yet. Good thing it’s always 84° at Great Wolf Lodge! Plan your spring getaway today for as low as $89.99/night when you use a special coupon code. Book your stay by 4/19/19 and use the coupon code BLOSSOM to see these special rates which are available on dates through 6/19/19 (note that discounts may vary by date). 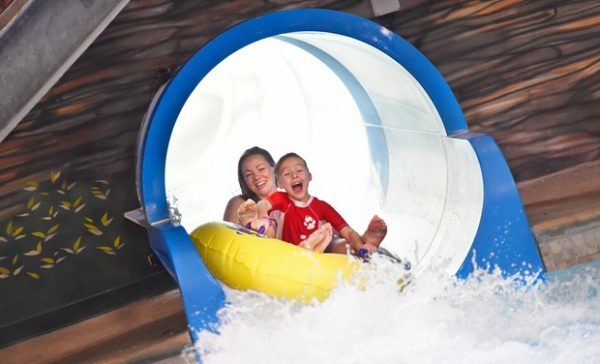 The heart and soul of Great Wolf Lodge Bloomington is its 75,000-square-foot indoor water park. Splashy rides such as River Canyon Run—a four-story raft water slide—and a zero-depth-entry wave pool with 3-foot swells surround the park’s iconic hub: a four-story treehouse with a 1,000-gallon tipping bucket. Younger kids will have a blast with the gentle spray features of Cub Paw Pool. The water park, which hovers around 84 degrees all year long, isn’t the resort’s only family-friendly activity. You’ll also find an arcade with more than 100 games and Scooops Boutique, where visitors can get fun nail polish and glitter tattoos. Extended and exclusive water park access: You can enter the water park at 1 pm on the day you check in and stay until close on the day you check out (essentially 2 days’ water park admission). And since there are no day passes for outside visitors, resort guests have exclusive access and won’t get stuck in long lines. Family-friendly fun: The resort has games and activities for kids of all ages. Explore options by age group here. Hands-on crafts and activities such as face painting and balloon twisting during the Lunch Time Lineup can keep kids entertained when they want a break from the water park action. Roomy suites comfortably sleep up to six guests. Some suites offer extra privacy with enclosed bunk beds. Fuel up with food and drinks at eight restaurants and snack bars. 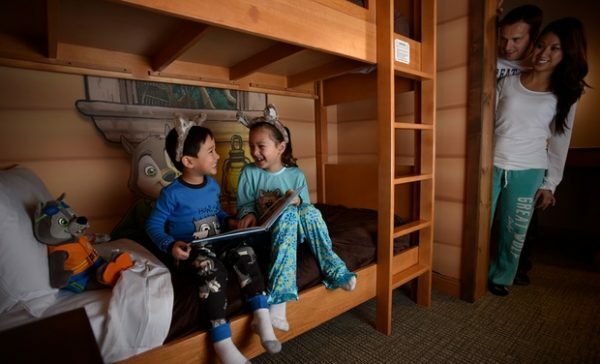 Add a Paw Pass or Pup Pass to your stay to enjoy kid-friendly activities and sweets at Creation Station, Oliver’s Mining Co., and more at a discounted rate. See everything that’s included—as well as other available packages—here (additional fees apply). Safety first: Complimentary life jackets in multiple sizes and trained lifeguards help keep families safe and secure. Besides the water park, don’t forget that there is plenty of dry fun, too! Great Wolf Adventure Park is filled with activities and experiences that are fun for the whole family. 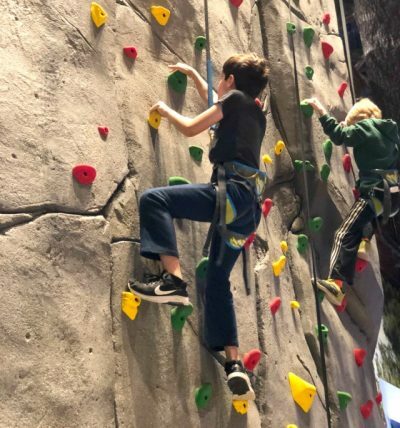 There are lots of active experiences to work off that never-ending kid energy and ways for them to put their thinking caps on, too. Check out our crew’s experience with Great Wolf Adventure Park in Bloomington to see what they have to offer!